A lot of things went wrong on the July 2018 Patch Day on July 10, 2018. System admins and users flocked to forums and support sites to report all kinds of issues starting with installation issues and ending with issues that caused certain features to work incorrectly. Microsoft published KB4345421 for Windows 10 earlier today that addresses issues on Microsoft's newest operating system. Updates for Windows 7, Windows 8.1, Windows Server 2008 R2, and Windows Server 2012 R2 are now also available. KB4345459, Improvements and fixes - Windows 7 Service Pack 1 and Windows Server 2008 R2 Service Pack 1, includes quality improvements according to Microsoft. 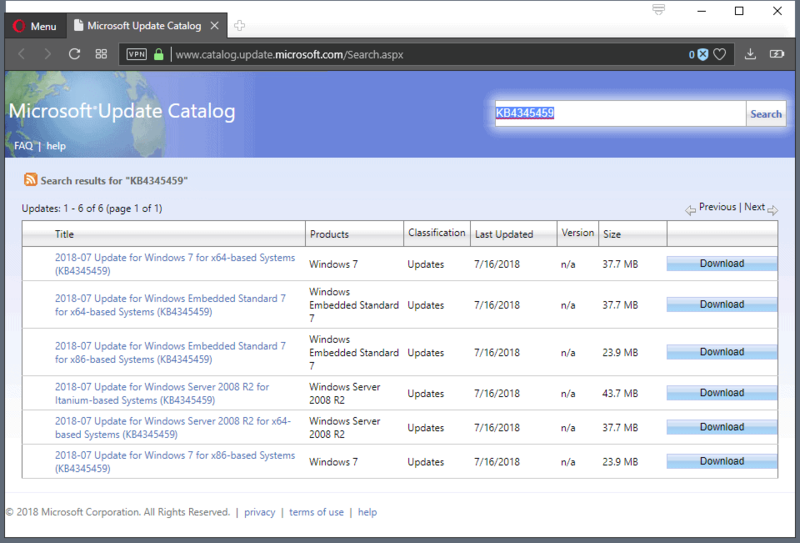 Admins and users can download the update from the Microsoft Update Catalog website. The update has a size between 23.9 and 43.7 Megabytes. KB4345424, Improvements and fixes - Windows 8.1 and Server 2012 R2, addresses the same issues that KB4345459 addresses. 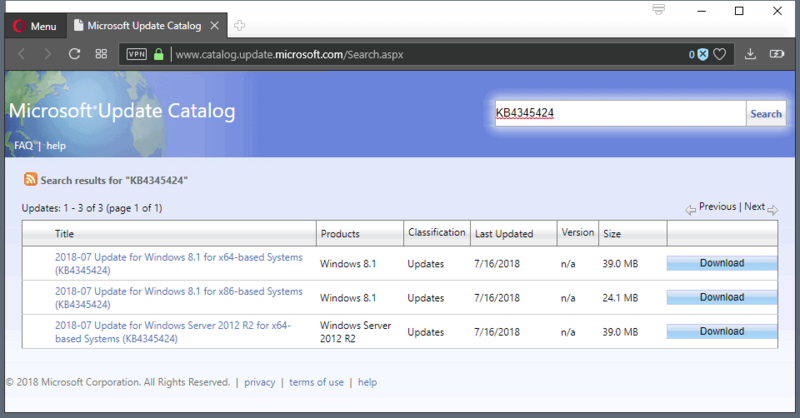 You can download the update from the Microsoft Update Catalog website. The update has a size between 24.1 Megabytes and 39 Megabytes. You may have guessed it already, KB4345425, Improvements and fixes - Windows Server 2012. fixes the same issues as the other updates mentioned above. It is available as a direct download on the Microsoft Update Catalog website. The update has a size between 25.4 and 40.9 Megabytes. Microsoft released .NET Framework Updates as well. While KB4340558 and KB4340557 have been updated. The known issue about error 0x80092004 being thrown still exist though according to the release notes. It is possible that Microsoft did not update the description yet and that the issue is resolved. Any feedback on that is much appreciated. The July 2018 patches introduced quite a few issues; several of the issues were not listed initially on the support pages but were added retroactively to the pages. Another reason to wait with the installation of updates to make sure that they don't introduce issues of their own. Microsoft release updates for Windows 7, Windows 8.1, Windows Server 2008 R2, and Windows Server 2012 R2 on July 17, 2018. The issue appears to be not resolved yet. Just tried re-downloading and installing KB4340558 on Windows 8.1 x64. Resulted in an aborted installation with the very same 0x80092004 error as before. So are the July updates safe to install now from askwoody. This totally fixed an issue I was having that just started recently. On Windows 7 x64, both utorrent, and qbittorrent, when exiting the program, its process would hang, and never end. Forcing end task in task manager, did nothing, only rebooting would get it to end. This update fixed it. Do we need to install KB4338823 before KB4345459 or is it enough to install only KB4345459 to a Windows 7 64 bit system, that has no 2018 July updates installed on it? With one word: does KB4345459 replace/supersede KB4338823? When you check the Update Catalog listing and there the package details, you see which updates KB4345459 replaces. Next to KB4345459 we can read, that it replaces patch from 7/10. After all these, what is the truth? I think these are reliable sources, that’s why I asked you if you have any specific experiences. 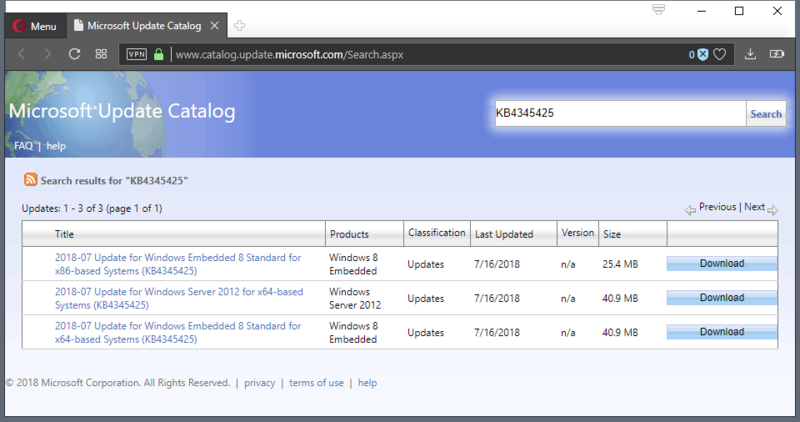 An other strange thing for me, that in Catalog we can see, that KB4338823 was last updated on 17 July while KB4345459 earlier on 16 July, so how can an older package be either a replacement or a patch to a newer released package? Is it possible, that the newer release (7/17/2018) of KB4338823 does no longer contain the bugs (or contains the fixes), which were in the old version (7/10/2018) of the package? Starting the Friday after this month’s Patch Tuesday, I used WSUS Offline Update to download and install *security-only* updates (not quality rollups) on five Windows 7 x64 systems and one Windows 10 x64 system. (I don’t know offhand what build the Windows 10 system is, other than that it’s not the latest one.) On the Windows 7 systems, I had to deselect C++ Runtime and .NET Framework updates in order to get WSUS Offline Update’s download stage to run to completion instead of throwing a fatal error and aborting. This seems to affect all kinds of network related apps like Oracle db listener, Manage Engine Desktop Central, self-made windows services using tcp/ip.